José “Pepito” Gómez began his musical career in his hometown of Florida in Camagüey, a province in central Cuba, where he cut his teeth singing with local groups and playing trumpet in the municipal band. His first professional break came when he auditioned for the legendary group Maravilla de Florida and was hired as their new lead singer. After two years, he left the groupto move to Havana, where he joined La Charanga Latina and had his first opportunity to tour Europe and North America. He left the group after a couple more years, to work on his own music. He continued to sing and tour with other groups including Colé-Colé, Azúcar Negra, and Compay Segundo of the Buena Vista Social Club. A great opportunity presented itself when he was asked to join musicians from the famed group Irakere as a founding member of Habana Ensemble. It was through this renowned group that he had the good fortune to meet the legendary César “Pupy” Pedroso, pianist, composer, and co-founder of arguably the most popular Cuban group in the world, Los Van Van. Pedroso asked Gomez to be the lead singer in a new group he was forming called Pupy y Los Que Son, Son. He moved to New York in 2008, where he would continue to work on his own music until 2012, when he left for Puerto Rico to sing with José Lugo’s Guasabara Combo. After two years there, he returned to New York to resume singing with a number of groups. One group he would often sub in for as lead singer was Los Hacheros, lead by Jacob Plasse. Gómez would forge a friendship with Plasse over their shared love of Cuban music. Together they would rediscover the sounds that Gómez knew from childhood on a journey that would culminate in the creation of Orquesta Akokán. 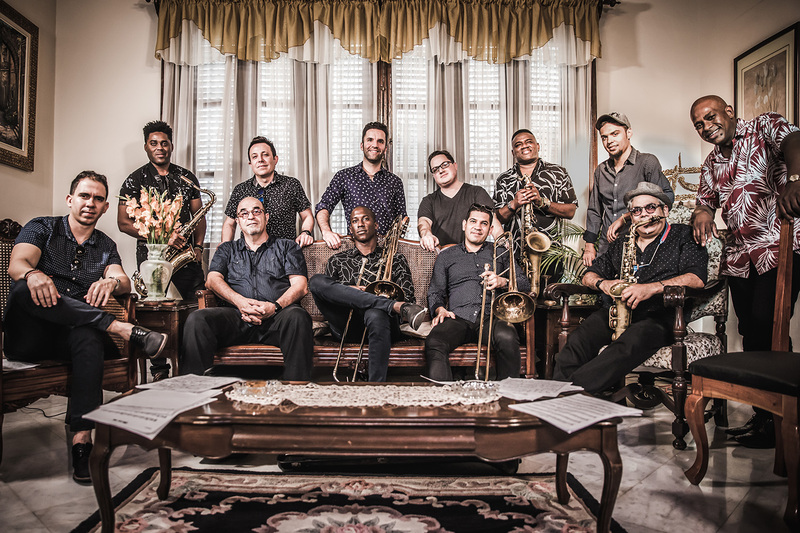 Jacob Plasse wanted to get back to the sounds that initially made him fall in love with Latin music, so he formed Los Hacheros with some of his favorite musicians from the salsa scene. They recorded an album, Pilon, live on an old 388 Tascam tape machine, and gig by gig Los Hacheros developed a reputation as salseros of the vieja escuela. Around this time Jacob began playing tres for the musical “Celia” about the life of Celia Cruz, where he met pianist Mike Eckroth. Realizing their shared musical affinities they began making albums together, with Plasse creating Chulo Records and Productions, a label focused on vintage Latin music. Shortly thereafter Flor de Toloache signed with Chulo. DzLas Caras Lindasdz, which Plasse produced, went on to win a Latin Grammy for best Mariachi/Ranchero Record, the first time an all-female ensemble had won that category. However it was his friend, pianist and arranger Michael Eckroth, who lent him the Beny Moré album that would inspire the next chapter in his love affair with Cuban music. Michael Eckroth is an accomplished pianist, composer and arranger from Phoenix, Arizona who has recorded and toured internationally with numerous jazz and Latin music greats including Johnny “Dandy” Rodriguez, Andy Gonzales, Nelson Gonzales, Pedro Martinez, and John Scofield. He earned a PhD from NYU with a thesis on Cuban piano solos of the ’40s. Through his academic work, he gained access to an expansive archive of rare Cuban recordings. With his knack for arrangement and his intimate familiarity with the sounds of Cuba’s great big bands, Eckroth was the final piece of the puzzle. For Eckroth and Plasse, the original idea was merely to find a way to work with “Pepito” Gómez. They got together and worked on some arrangements, planning to cut a record of old-style Cuban music that Gómez had been writing. However initial sessions with New York musicians left the trio flat. It wasn’t until Gómez invited the duo to accompany him on a trip to Cuba that the project began to come to life. From the moment Plasse and Eckroth arrived at the legendary Areito Studios in Havana on November 7th, 2017, the cavernous, wood-paneled recording studio echoed itshistory back at them. It was the very room used by state owned labels Areito and EGREM as well as Panart before them to record all of Cuba’s most prominent albums since the early 1940s. However it wasn’t the ghosts of musicians past that gave them chills. It was the musicians who were actually there in front of them. Gómez had enlisted his old friend César Lopez from Irakere, and together they had assembled a group of some of the greatest musicians of Cuba, many of which had long been heroes and inspirations to Plasse and Eckroth: A saxophone section made up of Jamil Shery and José Luis “El Chewy” Hernandez on tenors, with Evaristo Denis on baritone, and of course César Lopez on alto. On trombones, Carlos “Afrokán” Alvarez Guerra of Cubanismo fame, Heikel Fabián Trimiño, and Yoandy Argudin. Santiago Ceballos Seijido and Harold Madrigal Frías on trumpets. Itai Kriss on flute. Eduardo Lavoy Zaragoza on bongo, with Otto Santana Selis on conga and sharing timbale duty with Carlitos Padron. Coros would be sung by Eddie Venegas and Luis Soto. Though Plasse himself rose to the occasion to play a bit of tres, and Eckroth handled the lion’s share of keys with inspired prowess, they did convince Pedroso to lend an inspired piano performance on “Cuidado con el Tumbador.” These musicians, armed with Eckroth’s hard-boiled arrangements and fronted by Gómez’ soaring vocals, were to be the backbone of Orquesta Akokán. Akokán is a Yoruba word used by Cubans to mean Dzfrom the heartdz or Dzsouldz, so it comes as no surprise that a recording like this would find its way back to Brooklyn’s Daptone Records. For nearly a generation, the venerable label has brought us soulful music in a myriad of styles, made in the present, but with all the craft and flavor of the classic recordings of the past. In doing so Daptone has enshrined both the genres it honors as well as artists creating new works in the universal canon of dance music. A perfect kitchen from which to serve this captivating baile between old and new, performedwith rhythm, with care, and above all, con akokán.